2012 Mazda MX-5 Miata Pros and Cons: Why (Not) This Car? I've wanted a Miata ever since Mazda revealed the car in 1989. I've never owned one. So, as often as I've advised people, "You can't go wrong with a Miata," there must be some decent reasons not to buy one. I drove this particular Miata on the way back from a driving vacation in West Virginia in a Scion FR-S, to get a clear sense of how the two cars compare. Clean and purposeful, no frills. 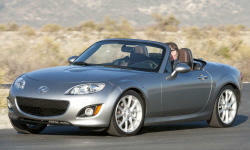 Why the 2012 Mazda MX-5 Miata? Fully redesigned twice since 1989, the MX-5 Miata has gained a few inches and a couple hundred pounds. But with a length of 157 inches and a curb weight under 2,500, it remains much more compact and much lighter than its closest competitors. The Scion FR-S, with a barely there back seat, is about ten inches longer and 300 pounds heavier. Combine this small size and light weight with a handling-oriented rear-wheel-drive chassis and Mazda's tendency to tune a car to respond quickly and communicate extensively, and you have a very fun, very involving car--even when you're not driving it hard and fast. If you've been seeking a visceral driving experience, you have few other choices among current cars. In the Miata, every nuance of what's going on where the rubber meets the road gets communicated to your ears, the seat of your pants, and your fingertips. Flick the wheel or blip a pedal, and the Miata reacts quickly and crisply, like a good dancing partner (not that I know much about good dancing). The Miata feels even smaller and lighter than it actually is. The opposite is the case with the FR-S (which wants to be a Z or even a Camaro when it grows up). The experience of driving them differs greatly. The Scion dominates the road. The Mazda dances along it. Ever since it was introduced, the MX-5 Miata has been among the least expensive sports cars you can buy, if not the least expensive. The tested 2012 in mid-level Touring trim with a $650 Suspension Package (sport suspension and limited-slip rear differential) listed for $27,275. For 2013 the Touring trim has been replaced by a new Club trim. It's $27,500 with the Suspension Package standard and black styling elements (mirror caps, lower body side stripe, wheels) that are a matter of personal taste (not mine). The basic $24,515 Sport and leather-trimmed $28,145 Grand Touring continue much as before. A Scion FR-S lists for $440 more than the Miata Sport, but includes about $2,700 in additional features. Compared to the Miata Club, the FR-S is $2,545 less before adjusting for feature differences, and about $3,800 less afterwards. The adjustments don't include one key Miata feature, though: a folding top. A likely future FR-S convertible would be priced very close to the Miata. The initial list price is only one piece of the puzzle. Unlike the FR-S, Miatas aren't in short supply, so you can count on substantial incentives and discounts. Also, Miatas don't depreciate rapidly or cost much to insure. Total ownership costs are low. Top has hard forward section that serves as a cover. Roll bars. Performance and character fit the car, but mpg could be better. A major reason Miatas hold their value is that they've proven to be among the most reliable cars you can buy. If something does happen to break, it will usually be cheap and easy to fix. Not much complexity here. Some people would put the Miata's powertrain performance among the reasons not to buy one. The 2.0-liter engine is peaky, kicking out 167 horsepower at a lofty 7,000 rpm. But for me, for what this car is, this engine is about perfect. Given the Miata's light weight, there's enough power, and the smoothly revving four just feels and sounds right. The 2.0-liter engine in the FR-S produces 200 horsepower, but with a deeper voice and more surges and lulls on the way to its similarly lofty peak. The Miata's short-throw shifter and clutch are also about as good as they get, with low efforts but excellent precision and plenty of feedback. The original 1990 Miata had clean, classic lines. The first redesign, for the 1999 model year, kept the same general appearance, only substituting fixed headlights for popups. The second redesign, for 2006, busied the shape up, adding fender flares. A 2009 refresh substituted a smiley front fascia that, thankfully, works better here than it did on the 2010 Mazda3. In recent years car designs in general have gotten busier and busier. In the current context, the Miata actually appears clean, flared fenders notwithstanding. Inside the car, the last refresh removed some of the 2006's trendier elements, leaving an inarguably clean, purposeful design. While a Miata is hardly striking inside or out, compared to the FR-S it's a timeless beauty. Why Not the 2012 Mazda MX-5 Miata? The first con is the obvious one, and a deal killer for many people. While the FR-S has a barely usable rear seat, the MX-5 Miata has none at all. The trunk can hold five cubic feet. Enough for a short trip if you pack smart. But even an FR-S can hold a couple more cubes. The Pontiac Solstice and Saturn SKY had less useful trunks, but they're dead. Smiley opening added in 2009. Looks better without a front plate. Compared to earlier Miatas, or something truly minimal like a Lotus Elise, the current generation car is smooth and quiet. But compared to any non-sports car it's rough and noisy, especially with the optional sport suspension (standard on the Club) and the top up. I didn't drive the Miata long enough to evaluate its livability as a daily driver. (The FR-S failed this test.) Some people commute in them. I'm not sure I would. Similarly, there's more room inside the current Miata than in the first two generations, but the cockpit remains a tight fit for anyone much over six feet in height and/or not in fighting trim. Personally, I fit very well, and prefer the current car's lower seating position, as the windshield header and rearview mirror no longer impinge on my view forward like they did in earlier Miatas. All windows are small, so the interior does induce some claustrophobia with the top up. The obvious fix: put the top down. It's manual, but a simple toss over your head. A power retractable hardtop is available ($1,760 on the Club, $1,900 on the Grand Touring). It adds just a little weight and doesn't take away trunk space, but unless you'll be using the car as a daily driver probably doesn't make much sense. Aside from the optional top, few gee-whiz features are offered on the Miata. You can get proximity key and Bluetooth on the Grand Touring, but no nav or fancy touchscreen controls. Also no power seats, no cameras, and none of the latest safety aids. They're not needed. If you can't easily tell what's going on around the car with your eyes, they must be closed. If you're into bells and whistles, the Miata isn't the car for you. The first four "why nots" shouldn't have come as a surprise to anyone. This one might. I didn't ding the MX-5 Miata's engine for its power output, but I am going to ding it for its fuel input. While EPA ratings of 21 mpg city and 28 mpg are hardly abysmal, the FR-S does better (22/30) and a 315-horsepower Porsche Boxster S does about as well (20/28). With one of Mazda's new SKYACTIV engines, the Miata would go much farther on a gallon of gas. (The 2,900-pound Mazda3 is rated 27/39.) But this engine won't happen until the Miata is again redesigned. You can buy faster or fancier cars, but you can't buy one that is much more fun to drive, especially not at legal speeds. The Scion FR-S might be the affordable sports car of the moment, with more power and higher handling limits, but it is a less thoroughly satisfying car to drive than the more tossable, more communicative Mazda Miata. Sadly, with grad school in South Side Chicago followed by marriage and three kids, I've not been in a place where I could make much use of a car that can carry only two people and a couple of small bags. If you are, you really can't go wrong with a Miata. Looks okay with the top up. Tom Davis at Park Mazda in Wooster, OH, provided the car. Tom can be reached at 330-345-8506. 2012 Mazda MX-5 Miata pros and cons, according to Michael Karesh: the best reasons for buying (or not buying) the 2012 Mazda MX-5 Miata. Join TrueDelta to post your own impressions.